This week's blog post is guest written by Illinois State University student, Paige Meints. She is an undergraduate student studying Food, Nutrition, and Dietetics at ISU. When I think of summer, I think of the smell of burgers, charbroiled on the grill. Although delicious, hamburger meat patties tend to have a lot of saturated fat and to be high in calories; by the time you top it with your favorite condiments, veggies, and a hamburger bun it's not unusual for it to weigh in anywhere from 400-500 calories and 10 grams of saturated fat. It's certainly fine to indulge in a juicy burger every now and then but there are also ways to enjoy summer grilling without all the fat and calories in a traditional meat-patty. 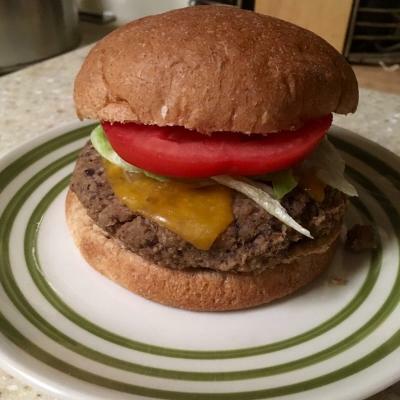 There are a huge variety of substitutes for hamburger patties—you could use portabella mushroom caps, black beans, quinoa, garbanzo beans, or even cauliflower! Using these substitutes the calories and fat can be cut in half and the burger can offer more vitamins and minerals than the traditional meat-patty. This cut in calories and saturated fat also leaves room to splurge on your favorite toppings and condiments. Drain liquid from canned black beans and rinse thoroughly in strainer. Pat dry with paper towel removing as much liquid as possible. Place in food processor and pulse until mashed. Remove from food processor and set aside. Place bell pepper, onion, and garlic in food processor and process until finely chopped. Remove as much excess liquid as possible. Add beans and continue to pulse until beans and vegetables are well mixed and pureed. Add spices and egg to mixture and pulse in food processor until well combined. Remove from processor and place in large bowl. Stir in bread crumbs a little at a time until mixture becomes dough-like. Add more bread crumbs if needed to get the correct consistency. Grill burgers on well oiled grill for about 4-5 minutes on each side or bake in 375 degree oven on a lightly oiled baking sheet for 10 minutes on each side. Top with additional burger toppings and condiments if desired, serve immediately.